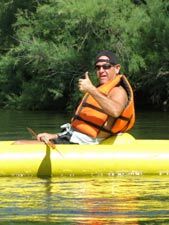 As part of a very fun Golfing Vacation to Scottsdale in May 2009, we took an enjoyable guided kayaking trip down the Salt River with Desert Voyagers Guided Rafting Tours. Year round for the last 25 years they have been taking people like you and I on guided half day trips down the lower portion of the Salt River. The Salt River is free-flowing from its headwaters down to Theodore Roosevelt Lake, where the first of four hydroelectric generating dams are located. Paddlers describe the Salt River as either Upper Salt River which means above Roosevelt Lake or Lower Salt River which is below Roosevelt Lake. 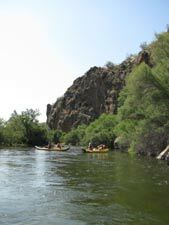 The Upper Salt River is know for Class II to IV whitewater and beautiful desert scenery. 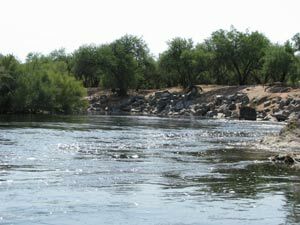 The Lower Salt is flat water, with a few small rapids, as it flows through Tonto National Forest just a few miles outside Mesa Arizona and runs past the cities of Mesa, Tempe, and Scottsdale then south of downtown Phoenix. The Salt River is a major source of irrigation and drinking water for Phoenix and the surrounding areas. The rivers water is distributed over more than 1000 miles of irrigation canals and the water is used primarily for growing cotton, alfalfa, fruit, and vegetables. 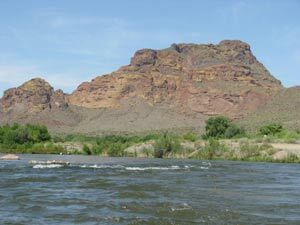 The natural flow of the Salt River is 2570 cubic feet per second (cfs) at its mouth and around 1500 to 2000 cfs on the section where Desert Voyagers has float trips. From October to April, the river flow is 500 to 600 cfs because more water is released for irrigation. If you're from Texas and have floated the Guadalupe, for comparison in July 2009 the Guadalupe was flowing at 61 cfs and when it reaches 1200 cps it is too dangerous for tubing. On the Guadalupe, 100 to 400 cps is considered recreational and 500 to 800 cfs is considered strenuous! The Salt River also flows about three times faster than the Rio Grande and in July the Colorado River flow between Bastrop and Columbus varies from about 1,500 to 1,800 cfs. After all that mumbo jumbo, the bottom line is that in May, the Salt River was flowing fast enough that we could have made the whole trip without having to paddle or running aground. 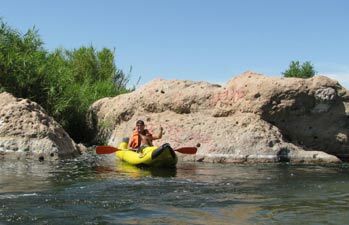 Desert Voyagers offers two types of guided floating trips - rafting or "funyaking." Rafting options include a trip on a 10' raft for 4 people, 12' raft for 4 to 6 people, or the 18' raft that holds 6 to 12 guests. We decided on a funyak and really enjoyed it. The funyak is an inflatable 12 foot kayak, can be paddled by one or two people, and gives you more freedom than the raft. I was pleasantly surprised to find the funyaks comfortable, very stable, and easy to maneuver. We met our guide in a Walgreens parking lot and piled in Desert Voyager's van with 6 other funyakers for the 20 minute drive to the put-in spot. After a brief lesson and standard safety briefing, we shoved off and began learning to coordinate padding with our partners and figuring out how to steer. As we drifted with the current our guide continuously pointed out geological formations, wildlife, and provided some local history - which made the trip interesting as well as educational. 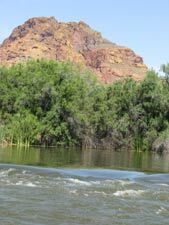 Floating down the Salt River through Sonoran Desert topography we saw majestic mountains, verdant valleys and sheer cliffs, many species of cacti, sagebrush, tumbleweeds, and a wide variety of desert flora and fauna plus wildlife including Bald Eagles, river otters, and wild mustangs. We took our trip on a Wednesday and didn't see another soul, except for some local fighters getting ready to get wet and practice water rescues and wild herons, osprey, bald eagles, a wild mustang, and a coyote. There was a feeling of remoteness and it was great to escape the heat, noise and hustle and bustle of metropolitan life on a very relaxing, soothing, and enjoyable float. Better yet, escaping the 100 degree air and sliding into the chilly water (typically 68 degrees) briefly took your breath away - but it only took a few seconds to get used to the cool, clear, and very refreshing water. The spontaneous water fights also kept us cool. 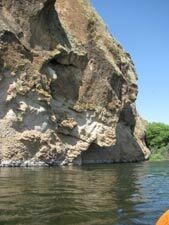 I enjoyed swimming in several sections of the river that were up to 20 feet deep, as well as just holding on the the back of the funyak and floating down the river on my back. 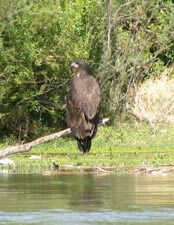 Thanks Desert Voyagers Guided River Tours for a fun four six mile trip that was ended much too soon. 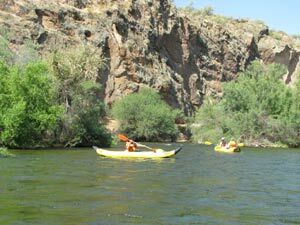 Return to the Kayaking Page or to the rest of the Vacation in Scottsdale article.